Prajnanpurush Sri Sri Babathakur was a Self-realized divine soul who had realized the total identity of Truth Divine within His own Self, as also within the Self of all. The culture and education we cultivate in our daily lives aren't all perfect. They are rather combinations of imaginary and speculative doctrines, thesis, theories, thoughts, ideas, actions, results and objects of the apparent nature that are transitory, ever changeable and perishable. The outer nature of life, though very helpful for the constitution and maintenance of physical body, is also a bar for the perfection of the same and realization of the inmost essence of life. For the perfection of one's total nature and the realization of the inmost Self, what is mostly needed is not the cognition of the outer changeable and perishable nature, but rather recognition of the inmost perennial light of ever-free unchangeable nature, i.e. unmixed, free, homogeneous, true, and eternal Consciousness. India is a land ordained to receive special divine grace. It is place where seers and realizers of extraordinary class are born to reveal the eternal and absolute Truth to her people. Such a realizer, Sri Sri Babathakur was born in a remote part of undivided Bengal at the end of the first quarter of the last century. His was a family that was lowly in worldly possessions but rich in spiritual and psychic traditions. From His very childhood, Sri Sri Babathakur was inquisitive about everything, and especially about his own Self . He was eager to know why was He born. He was told by his father that the answers to such queries had to be found out by Him alone. At a tender age, Sri Sri Babathakur commenced His spiritual journey to unfold the mystery of the eternal Truth. He soon became introspective and delved deep into the realms of His own Self/Truth Absolute. In due course, He became a true realizer to whom the Self-Reality revealed itself in full, in the nature of I-Absolute. 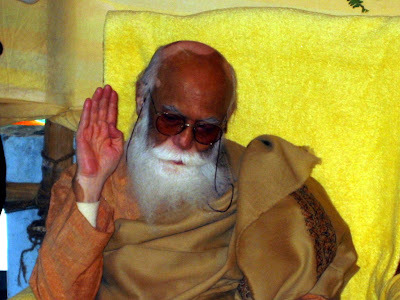 Sri Sri Babathakur attained the highest state the spiritual seekers aspire to, and became verily Saccidananda - i.e. the Truth, Consciousness and Bliss Himself. The grace He received was the result of His own endeavor and He is a true Self-realizer-'Swanubhavadeva'. Alongside his spiritual pursuits, He continued His journey in the mudane world, training Himself as a painter-artist although by choice, He was a sitarist and a classical musician of highest genius. However as he proceeded further in His the journey of Self-discovery, His occupation began to dissolve, culminating in the revelation of the Divine Personality with 'missionless mission' and His identity with the TruthAbsolute. Pen would drop from his hands, the touch of money would cause shrivels in Him. Through His trances and novel way of meditation, He sailed into His eternal destination. Bet despite leaving His mortal remains, He returns to the mundane plane quite often to illuminate the minds of the people through His deliberations. A realizer of the highest order, Swasamvedya Swanubhavadeva Sri Sri Babathakur realized and narrated the 'Science of Oneness' which is the 'Knowledge of Knowledge'. His realization was so unique and original, it not unfolded the reality of non-duality in a celebrated unconventional manner, but also showered an unprecedented new light and dimension of Advaita-Vedanta Knowledge. His realization often been expressed itself through innumerable spontaneously revealed songs, some of which at a later period were sung by His devotees under His tutelage. His deliberations as well as these revealed songs pronounce the truth - 'Saccidananda is the I-Absolute and vice-versa 'This I-Absolute is the all-perfect Divine'. Several of us Bhaktas of Sri Sri Babathakur have often considered contributing articles for publication in Sri Sanai, the spiritual qaurterly journal published by the Saccidananda Society in Kolkata. Extreme inertia, lack of focused time and lack of experience in writing for an established magazine have been key factors in preventing us from doing so. The appropriateness of topics has also been a big question mark in our minds. Early last year, Sri Sri Babathakur asked Sri Partha Guha to look into the formation of a North American Chapter of Saccidananda Society. Per Sri Sri Babathakur’s suggestions, Mr. Guha met face-to-face with several Bhaktas in North America. He also organized a meeting between the overseas Bhaktas and Sri Sri Babathakur on the occasion of Guru Purnima in Kolkata. At that meeting, Sri Sri Babathakur asked his Bhaktas to begin the publication of a “hand-written” magazine – preferably on a monthly basis. He wanted us to use this informal media to express ourselves on various topics. He did not limit us to write on a particular range of topics. In fact He said – “Let them contribute whatever they like”. While we received clear guidance on starting the publication, we simply did not know where and how to begin. Over the 2008 Christmas holidays, some of us got together for a Bhajan session at Mr. Soubhik Pataranabis’s house in southern Oregon. It was snowing outside and we were all enjoying the savory snacks that were being dished out by the ladies in the house. This got our creative juices flowing and we quickly realized that creating a “e-zine" would be the closest thing to a hand-written magazine. Since we anticipated most contributors to not only have full time jobs but also very busy lives away from work, we decided that the e-zone would be published on a quarterly (rather than on a monthly) basis. Smt. Sroddha Patranabis (founder of the 'Bangla Bodhu' blog on Orkut) was nominated to edit the bengali articles, and Sri Anjan Dasgupta to edit the English submissions. Quick emails were sent out to Bhaktas informing them of our decisions. * Leave a lasting legacy of His teachings for our children and future citizens of this society.We sincerely hope that the readers of this e-zine will willingly contribute their articles in the quarters to come. You can send in your articles for publication in future issues of e-Sanai to sanai.na.editors@gmail.com Also, we fully welcome your suggestions and feedback with regards to making e-Sanai a more enriching reading experience. We eagerly look forward to your suggestions and feedback on making e-Sanai a more pleasurable reading experience. Comments may be sent to sanai.na.editors@gmail.com. You may also provide your comments directly in the blog, although our blog comments are moderated.